Top - Cremieux, Blazer - LC Lauren Conrad, Pants - Lonny's, Bracelets - JewelMint, Heels - Jessica Simpson (here and here), Handbag - Olivia + Joy, Nails - OPI's "Haven't The Foggiest"
Me and the ladies at the Lauren Conrad offices are sharing our beauty confessions on LaurenConrad.com this week. Be sure to stop by and check out our beauty mishaps here! You are so cute and stylish! 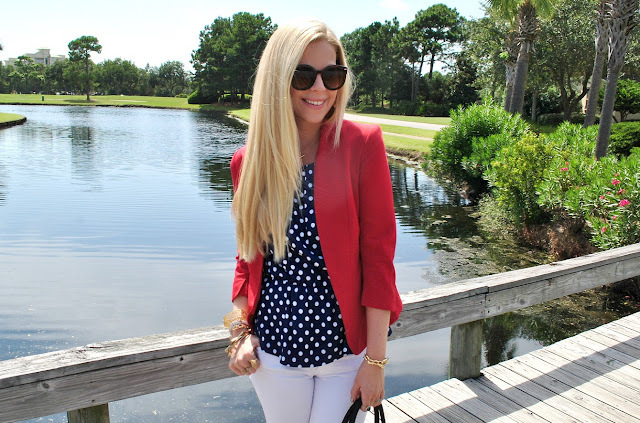 Lovely top and blazer mix. Today I show you another Casual & Comfy look including awesome sneakers.....and more pictures of my last trip. 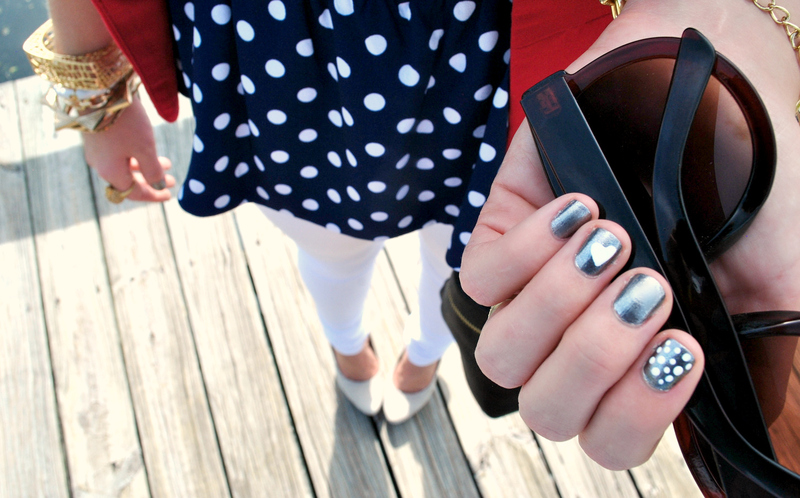 Love polka dot! And really cute manicure! Great outfit! Love the polka dots! Cute! I love polka dots too. you look gorge, love the polka dots. Gorgeous top! I love this look! I love Kate's dress! I think it's cool you got inspired by her! One of my favorite color combination to put an outfit together is red, white and blue. You styled these 3 colors perfectly. Love your top. Love that top! Gorg background! I love that red blazer! You're very pretty stylish<3 REALLY LOVE YOUR BLOG TO THE FULLEST! if you dont mind to check out my blog and follow me back? I just want to keep in touch with you, thankyou if you want to follow me back! Favorite combo ever! Love the colors and that peplum top has pretty much everything I like! Your nails are adorable. 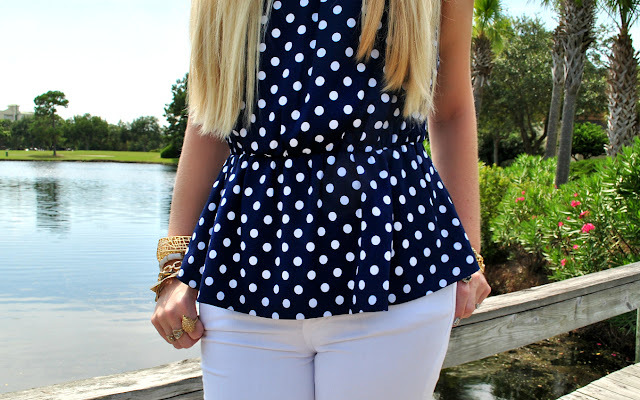 Love the polka dot blouse, such a cute outfit! Love this cute polka dot peplum top! You look so pretty in this outfit! very chic heels and dot top!! love the color of your blazer!! This outfit is absolutely gorgeous - red, white, and blue perfection! Love this all american look! i love the top and the bag! I NEED white pants. These are SO SO chic. Love the look! Great top and jacket. So chic!!!! Love this outfit and the location. The peplum is über cute. I adore polka dots. I'm currently wearing pants that I polka dotted myself. They're probably one of my favorite pairs of jeans. I love this look & especially the RWB combo! 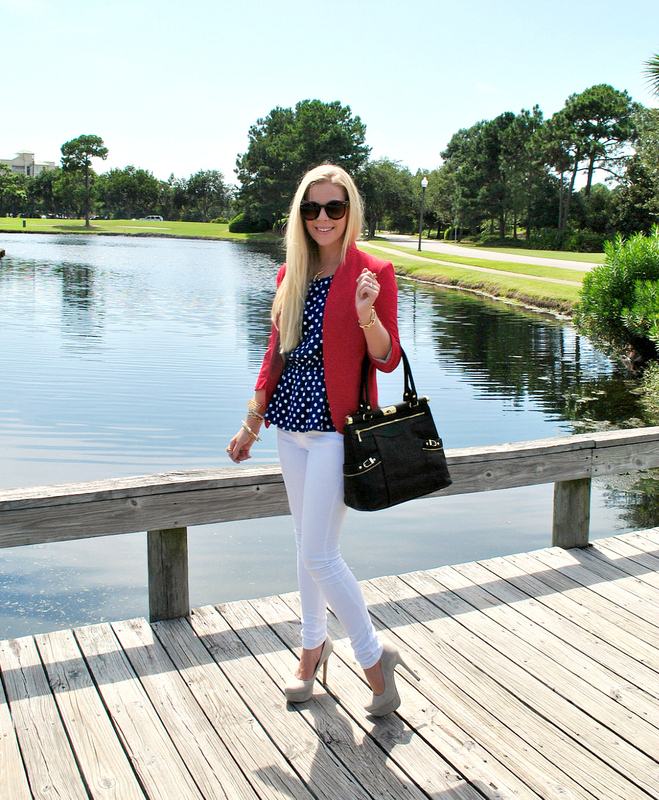 A cute patriotic look :) Love polka dots with peplum! I absolutely LOVE this outfit! Dots are so adorable and I love the white pants. Stunning all-american look. Such a fan of representing the USA! The way you paired the navy peplum with the statement blazer is chic but not over the top. And your nail art is too cute!! you look gorgeous! also, though, teh background where you are looks beautiful! You did a great job on your nails!! And the outfit is so patriotic! Lovely, girly, and super patriotic. I'm crazy about your blazer!) It's really fantastic!!! LOVE this outfit! It has such a classic, retro feel to it! That peplum top and your white pants look amazing on you!